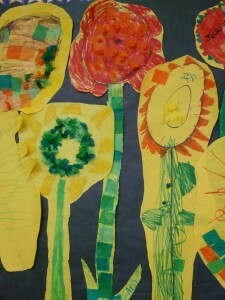 Little a’s class made these flowers a few years ago for Earth Day! Can you find the one she made? Hint: She loves, loves, loves orange. Yup, the pretty one in the middle. Blooming flowers are just one piece of nature that floods my mind when I think of Earth Day. Nature in it’s pure form. Untouched by “us”. Please give thanks to Mother Earth for all that she provides to us. It’s a good day for me to reflect on my needs and my wants. I don’t need 10 pairs of shoes, I don’t need 10 jackets, I don’t need 20 pants, etc, etc, etc! I just need to slow down, sit and realize all that I have and then I’ll realize all that I need.